Fermentation in food processing is the process of converting carbohydrates to alcohol or organic acids using microorganisms—yeasts or bacteria—under anaerobic conditions. Fermentation usually implies that the action of microorganisms is desired. The science of fermentation is known as zymology or zymurgy. Other widely consumed fermented foods include vinegar, olives, and cheese. More localised foods prepared by fermentation may also be based on beans, grain, vegetables, fruit, honey, dairy products, fish, meat, or tea. Natural fermentation precedes human history. Since ancient times, humans have exploited the fermentation process. The earliest archaeological evidence of fermentation is 13,000-year-old residues of a beer, with the consistency of gruel, found in a cave near Haifa in Israel. Another early alcoholic drink, made from fruit, rice, and honey, dates from 7000-6600 BCE, in the Neolithic Chinese village of Jiahu, and winemaking dates from ca. 6000 BCE, in Georgia, in the Caucasus area. Seven-thousand-year-old jars containing the remains of wine, now on display at the University of Pennsylvania, were excavated in the Zagros Mountains in Iran. There is strong evidence that people were fermenting alcoholic drinks in Babylon ca. 3000 BCE, ancient Egypt ca. 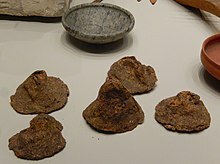 3150 BCE, pre-Hispanic Mexico ca. 2000 BCE, and Sudan ca. 1500 BCE. The French chemist Louis Pasteur founded zymology, when in 1856 he connected yeast to fermentation. When studying the fermentation of sugar to alcohol by yeast, Pasteur concluded that the fermentation was catalyzed by a vital force, called "ferments", within the yeast cells. 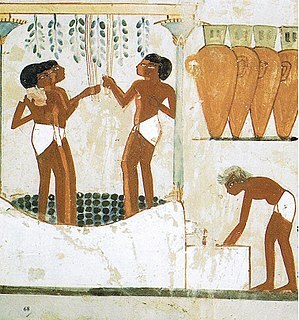 The "ferments" were thought to function only within living organisms. "Alcoholic fermentation is an act correlated with the life and organization of the yeast cells, not with the death or putrefaction of the cells", he wrote. Nevertheless, it was known that yeast extracts can ferment sugar even in the absence of living yeast cells. While studying this process in 1897, the German chemist and zymologist Eduard Buchner of Humboldt University of Berlin, Germany, found that sugar was fermented even when there were no living yeast cells in the mixture, by an enzyme complex secreted by yeast that he termed zymase. In 1907 he received the Nobel Prize in Chemistry for his research and discovery of "cell-free fermentation". One year earlier, in 1906, ethanol fermentation studies led to the early discovery of NAD+. Food fermentation is the conversion of sugars and other carbohydrates into alcohol or preservative organic acids and carbon dioxide. All three products have found human uses. The production of alcohol is made use of when fruit juices are converted to wine, when grains are made into beer, and when foods rich in starch, such as potatoes, are fermented and then distilled to make spirits such as gin and vodka. The production of carbon dioxide is used to leaven bread. The production of organic acids is exploited to preserve and flavor vegetables and dairy products. 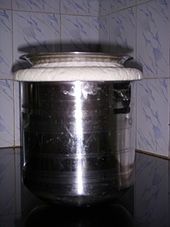 Food fermentation serves five main purposes: to enrich the diet through development of a diversity of flavors, aromas, and textures in food substrates; to preserve substantial amounts of food through lactic acid, alcohol, acetic acid, and alkaline fermentations; to enrich food substrates with protein, essential amino acids, and vitamins; to eliminate antinutrients; and to reduce cooking time and the associated use of fuel. 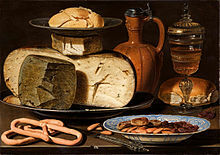 Europe: rakfisk, sauerkraut, pickled cucumber, surströmming, mead, elderberry wine, salami, sucuk, prosciutto, cultured milk products such as quark, kefir, filmjölk, crème fraîche, smetana, skyr, rakı, tupí. 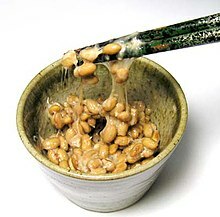 Amazake, beer, bread, choujiu, gamju, injera, kvass, makgeolli, murri, ogi, rejuvelac, sake, sikhye, sourdough, sowans, rice wine, malt whisky, grain whisky, idli, dosa, vodka, boza, and chicha, among others. Alaska has witnessed a steady increase of cases of botulism since 1985. It has more cases of botulism than any other state in the United States of America. This is caused by the traditional Eskimo practice of allowing animal products such as whole fish, fish heads, walrus, sea lion, and whale flippers, beaver tails, seal oil, and birds, to ferment for an extended period of time before being consumed. The risk is exacerbated when a plastic container is used for this purpose instead of the old-fashioned, traditional method, a grass-lined hole, as the Clostridium botulinum bacteria thrive in the anaerobic conditions created by the air-tight enclosure in plastic. The World Health Organization has classified pickled foods as possibly carcinogenic, based on epidemiological studies. Other research found that fermented food contains a carcinogenic by-product, ethyl carbamate (urethane). "A 2009 review of the existing studies conducted across Asia concluded that regularly eating pickled vegetables roughly doubles a person's risk for esophageal squamous cell carcinoma." ^ "'World's oldest brewery' found in cave in Israel, say researchers". British Broadcasting Corporation. 15 September 2018. Retrieved 15 September 2018. ^ McGovern, P. E.; Zhang, J.; Tang, J.; Zhang, Z.; Hall, G. R.; Moreau, R. A.; Nunez, A.; Butrym, E. D.; Richards, M. P.; Wang, C. -S.; Cheng, G.; Zhao, Z.; Wang, C. (2004). "Fermented beverages of pre- and proto-historic China". Proceedings of the National Academy of Sciences. 101 (51): 17593–17598. doi:10.1073/pnas.0407921102. PMC 539767. PMID 15590771. ^ "8,000-year-old wine unearthed in Georgia". The Independent. 2003-12-28. Retrieved 2007-01-28. ^ "Now on display ... world's oldest known wine jar". Retrieved 2007-01-28. ^ Cavalieri, D.; McGovern P.E. ; Hartl D.L. ; Mortimer R.; Polsinelli M. (2003). "Evidence for S. cerevisiae fermentation in ancient wine" (PDF). Journal of Molecular Evolution. 57 Suppl 1: S226–32. CiteSeerX 10.1.1.628.6396. doi:10.1007/s00239-003-0031-2. PMID 15008419. 15008419. Archived from the original (PDF) on December 9, 2006. Retrieved 2007-01-28. ^ Dirar, H. (1993). The Indigenous Fermented Foods of the Sudan: A Study in African Food and Nutrition. CAB International. ^ "Fermentation" (PDF). Archived from the original (PDF) on 2012-05-30. ^ Dubos, J. (1951). "Louis Pasteur: Free Lance of Science, Gollancz. Quoted in Manchester K. L. (1995) Louis Pasteur (1822–1895)--chance and the prepared mind". Trends in Biotechnology. 13 (12): 511–515. doi:10.1016/S0167-7799(00)89014-9. PMID 8595136. ^ "The Nobel Prize in Chemistry 1929". Retrieved 2007-01-28. ^ Harden, A.; Young, W.J. (October 1906). "The Alcoholic Ferment of Yeast-Juice". Proceedings of the Royal Society of London (Series B, Containing Papers of a Biological Character ed.). 78 (526): 369–375. doi:10.1098/rspb.1906.0070. ^ Hui YH, Meunier-Goddik L, Josephsen J, Nip WK, Stanfield PS (2004). Handbook of Food and Beverage Fermentation Technology. CRC Press. pp. 27 and passim. ISBN 978-0-8247-5122-7. ^ Steinkraus, K.H., ed. (1995). Handbook of Indigenous Fermented Foods. Marcel Dekker. ^ "Agents Classified by the IARC Monographs, Volumes 1–105" (PDF). International Agency for Research on Cancer (United Nations World Health Organization agency). Retrieved 10 October 2012. ^ "New Link Between Wine, Fermented Food And Cancer". ScienceDaily. Retrieved 10 October 2012. ^ "The WHO Says Cellphones—and Pickles—May Cause Cancer". Slate. Retrieved 10 October 2012.